As you've probably heard by now, you can claim a username on Facebook. The username that you choose will be embedded in the URL of your Facebook profile, which has obvious SEO implications. But did you know that you can also claim usernames for your business pages as well? This adds an unbelievable SEO benefit because you can claim a username that includes your firm name and/or any keywords that you'd like to rank for. 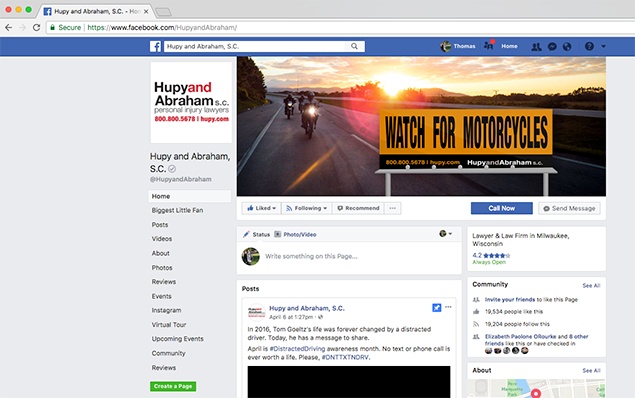 A client and good friends of ours, Hupy & Abraham, has a Facebook page for their practice. How does this help with the search-ability? Be found on Facebook for these related searches as well. Yes, people are using Facebook as a search engine, and this is becoming the case more and more after Facebook launched their real-time search feature. How do you claim the username (and SEO-friendly URL) for your Facebook business page? Click on "Set a username for your Pages"
Your page WILL NOT be able to claim a username unless it has at least 100 fans, so be sure to invite as many friends, family members, past and present clients, business associates, and whoever else you can think of to obtain as many fans as you can. Of course, most attorneys use Microsoft Outlook as their e-mail program and this may be holding you up from importing your e-mail contacts to Facebook to see who you can friend and expand your network (and Facebook Page Fans). For more information on how to import your contacts from Outlook and other e-mail programs so that you can get more Facebook friends (and fans of your business page), visit this Facebook help page.